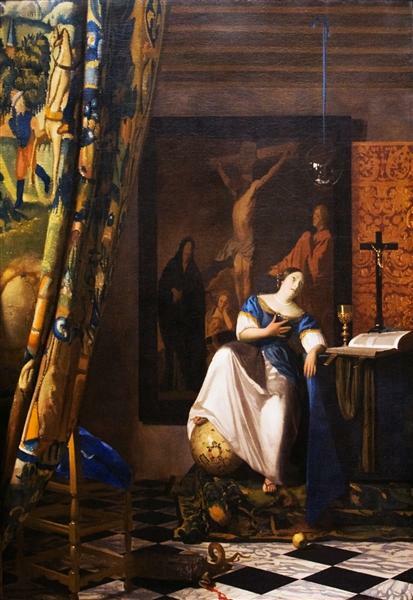 The Allegory of Faith, also known as Allegory of the Catholic Faith, is a painting created by Dutch artist Johannes Vermeer in about 1670–72. 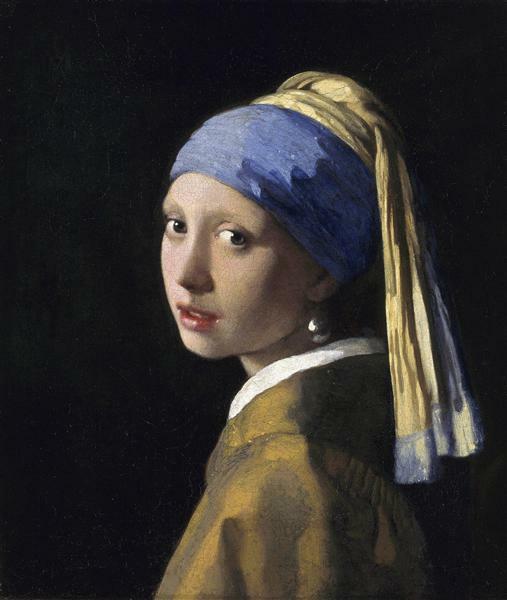 The painting is currently located at the Metropolitan Museum of Art in New York, and has been since 1931. This and Art of Painting are his only works that fall under history painting in the contemporary hierarchy of genres, though they still have his typical composition of one or two figures in a domestic interior. 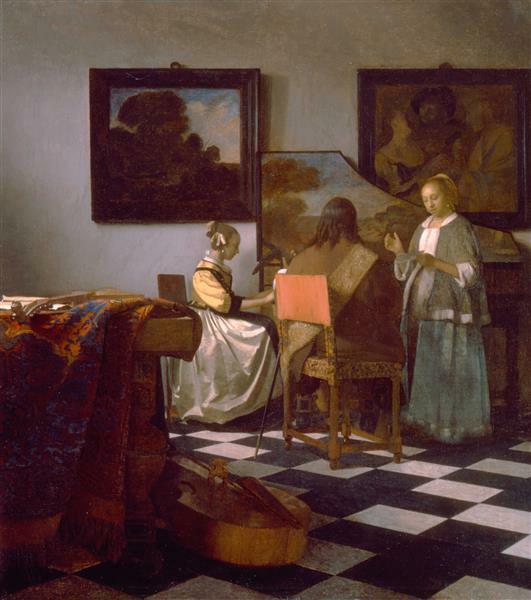 (The Art of Painting is Vermeer's only other allegory, painted earlier than Allegory of Faith.) Both share several features: the perspective is almost the same, and at the left of each painting is a multicolor tapestry pulled to the left to disclose the scene. The Art of Painting also uses symbolism from Cesare Ripa (of Clio, muse of history). 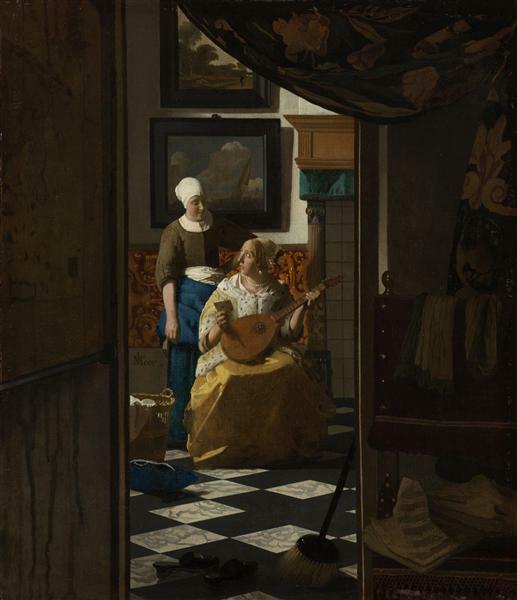 Vermeer's Love Letter uses the same or a similar gilt panel. 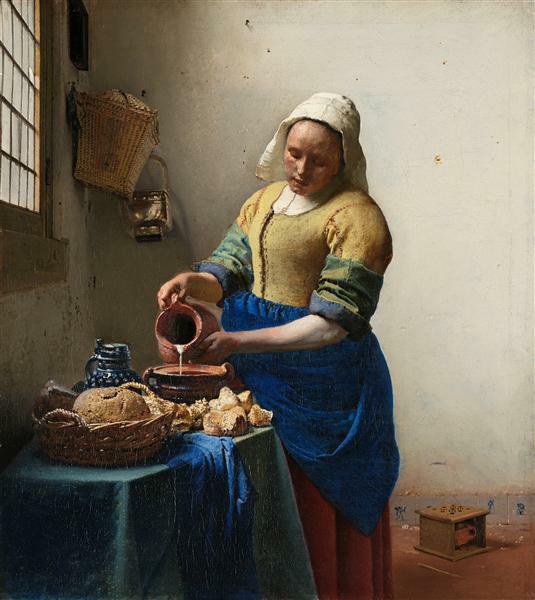 The Allegory and The Art of Painting differ markedly in style and purpose from Vermeer's other works. Both allegorical paintings show complex meaning, but Allegory of Faith "reveals that the artist's usual focus on naturalistic effects was a stylistic option, to be set aside when the subject called for another approach". The Art of Painting still reads as a naturalistic depiction of an artist and his model, and the pose of the model is simple, whereas the pose of the figure in The Allegory of Faith is Baroquely dramatic. The painting depicts a woman in a fine white and blue satin dress with gold trimmings. She sits on a platform a step higher than the black and white marble floor, her right foot on a terrestrial globe and her right hand on her heart as she looks up, adoringly, at a glass sphere hung from the ceiling by a blue ribbon. Her left arm rests on the edge of a table which holds a golden chalice, a large book, and a dark-wood crucifix. Behind the crucifix is a gilt-leather panel screen. Beneath the book is a long piece of cloth, possibly a priest's stole. Resting on top of the book is a crown of thorns. All of these items are on the platform, which is covered by a green and yellow rug, the edge of which is on the floor. At the bottom of the picture, nearer the viewer, is an apple, and nearer still a snake which has been squashed by a cornerstone. On the dim, far wall behind the woman, a large painting of Christ's crucifixion is hung on the wall behind the woman. To the viewer's left is a multicolored tapestry, pulled back at the bottom and seemingly the closest thing in the painting to the viewer. A chair with a blue cloth on it is immediately beneath and behind the tapestry and to the left of the snake and cornerstone. 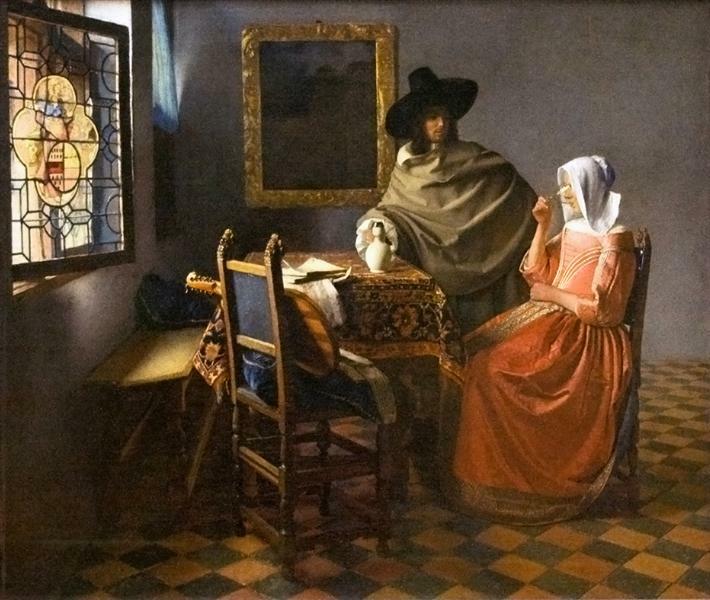 Vermeer's iconography in the painting is largely taken from Cesare Ripa's Iconologia, an emblem book (a collection of allegorical illustrations with accompanying morals or poems on a moral theme) which had been translated into Dutch in 1644 by D. P. Pers. The artist used various symbols that Ripa described and illustrated in his book, along with symbols taken from other books and traditions. Two of the four allegorical figures of Faith ("Fede. Geloof" and "Fede Catholica. 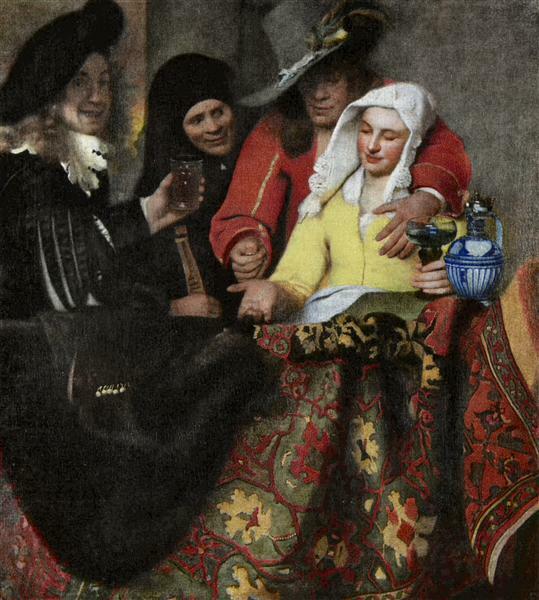 Catholijck of algemeen Geloof") given in Ripa's book provide many of the symbols in the painting, including the color of the woman's clothing, her hand gesture, and the presence of the crushed snake and the apple.